Hailing from South London, The Soul Immigrants are fine purveyors of energetic Deep Funk (&beyond!) and this release on 45/digital download marks their first output since they reformed in 2011. Brought to you courtesy of their own label Dry Rooti Records, this double-sider is a hard and gritty, fat and greasy future classic! 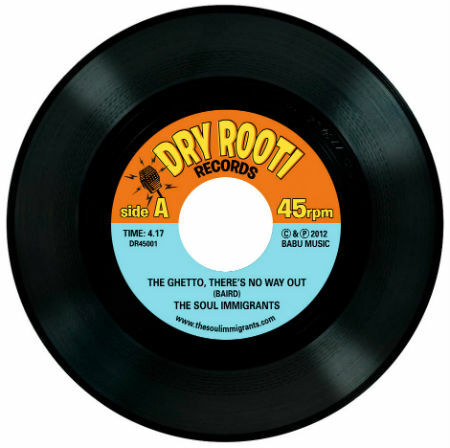 Both sides see the band back in swinging fashion, with the fantastic sounding single “The Ghetto (There’s No Way Out)” on A, an Afro-Funk barnstormer, deeply melodic, super tough and soulful, backed by the equal thrilling “Sunk Without The Funk” intoxicating liquor to get any party going! Warning you may feel liverish even after the first hearing! This double A sided single is rammed with punchy horns, harrowing hammond, twangy telecaster guitar grooves and a tough sounding live production that highlights their onstage explosive power! Masterminded by singer/guitarist (and well known Blues&Soul reviewer) Emrys Baird, who cut his teeth as a teenager with the legendary Funk Ambassadors (who backed the JB’s on their first ever UK tour in the late 80′s). Now head honcho in his own right sees his band continue to tread a well worn path and a firm commitment in keeping the flames of funk, fuelled and alight!